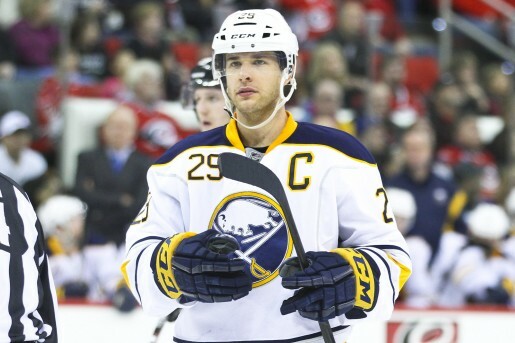 Going into his second year as the Buffalo Sabres’ captain, Jason Pominville has become the face of the franchise. So why not get to know a little more about the guy that is leading the Blue and Gold on and off the ice. The 29-year-old has many ties to the Quebec area. He was born and raised in Repetigny, Quebec and spent his junior career playing for Shawinigan Cataractes of the Quebec Major Junior Hockey League. During his time with the Cataractes Pominville played in 199 regular season games scored 107 goals and recorded 255 points. In 23 playoff games Pominville scored eight goals and recorded 17 points. In 2002 his performance in his final QMJHL season was good enough for a First All-Start Team selection. Pominville’s past is not only tied to Quebec and Canada. The Sabre captain has dual citizenship between Canada and the United States, so he is able to choose what country he represents in national play. In 2008 opted to represent the United States at the World Championships where he went on to grab two goals and five points. Pominville’s journey with the Sabres officially began when he was selected in the second round, number 55 overall, of the 2001 NHL Entry Draft. However, the Sabres did not take a chance with him until the ’05-’06 season, and after three seasons and 239 games with the Sabres’ AHL affiliate, Rochester Americans, he had finally earned a spot with the big club. Pominville did not reach that without some friction though. At the beginning of the ’05-’06 season he was actually placed on waivers by the Sabres. He cleared waivers and continued to play in the minors before getting called up later that season. Once given a real chance he didn’t disappoint, playing in 540 games for the Sabres, 335 of those games consecutively. Pominville has lit the lamp 175 times and has recorded 431 points since coming into the league. His leadership role started to be displayed during the ’07-’08 season when he was part of a rotating captaincy. At the beginning of the ’11-’12 season, while in Helsinki, Finland the Sabres announced that Pominville would become the Sabres’ full time captain, the 16th full time captain in Sabres’ history. Pominville has been a part of some big moments for the Sabres organization. He played a major role in the Sabres back-to-back trips to the Eastern Conference Finals, in ’05-’06 and ’06-’07, where he scored nine goals and recorded 20 points. During the ’06 playoffs he scored the only series deciding shorthanded goal in NHL history. Which sent Sabres’ announcer, Rick Jeanneret, off on one of the most memorable calls in team history. Throughout his playing career, Pominville has won one award. In 2002, he won the Frank J. Selke Memorial Trophy, awarded to the QMJHL’s most gentlemanly player. In 2008, he was nominated for the Lady Byng Memorial Trophy, awarded to the league’s most sportsmanlike player, but lost to Pavel Datsyuk. Pominville has two seasons remaining on his five-year $26.5 million contract extension that was signed back in’09. Fans are hoping for more memorable goals, awards, and maybe even a Stanley Cup Championship.